EliteGamble.com is a social network for Gamblers. We help people who gamble establish friendships with other players, get the latest deals from online and offline casinos, and fall in love with someone really special. This site was designed for gamblers to meet each other and form social groups to go out with or just stay in to gamble with. This way supportive relationships are created with those that have common goals to gamble and have fun. 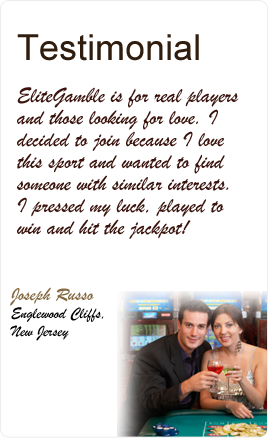 Elite Gamble brings people together to strengthen their love for the game, enhance their gambling knowledge and create a community of gamblers that want to enjoy their passion for the games. Our features include private email, instant messaging, gambling tips, places to gamble, forums, blogs, personality compatibility, video face chat, facial matches and a unique astrological comparison tool. Join Elite Gamble today totally free and fully privileged to utilize all its exclusive features. It's a private and easy way to meet people to gamble with anytime of the day or night. At EliteGamble.com we simplify socializing and make it easy to get to know people you click with! So take a break from people that do not support your love for gambling and make friends who really love it. Register on EliteGamble.com now and receive free handpicked matches of gamblers in your area, profile support and gambling tips. Remember, the first login is free and gives you full privileges on the site so you can experience what this elite online gamblers community has to offer. Always communicate with all EliteGamble.com members using EliteMate's secured servers. Do not give out your personal email address, postal address, social security number, phone numbers, instant message handles or any piece of private information to any EliteGamble.com members ever. Take as long as you feel necessary to get to know EliteGamble.com members using all of its anonymous communication features (Email, IM, Chat, Astrology And Personality Matching, Video, Texting, Voice, Greeting Cards, Browser Winks). Utilize all of EliteGamble.com's and EliteMate's member privileges to communicate with other EliteGamble members until you feel totally safe and secure. We highly recommend ALWAYS using EliteGamble.com's site powered by EliteMate.com to communicate with any EliteGamble.com members. Please review all of our safety tips here. We Simplify Socializing. All the pictures on EliteGamble.com are of paid models. The testimonials are real from members of the site. EliteGamble.com Is A Totally Free Social Network With Many Advanced Search And Compatibility Features Like None Other.